The reports inside Paragon are an essential tool for you, the REALTORS®, as you communicate with your prospects about properties that match their acquisition requirements. This Quick Start Guide focuses on how to use and customize the Paragon reports. After performing a search, you will typically see your results in a spreadsheet like below. A spreadsheet is our starting point for exploring the other reports inside Paragon. In the image below there are 3 rows of tabs and some additional tools. We are focusing on the Available Reports found in the bottom right corner of this screenshot. Row 2: Sub-tabs displaying screens based on the tab selected in Row 1. In the example below with Residential tab selected, there are 2 types of sub-tabs displayed. These buttons will be discussed in detail starting on page 8 of this Quick Start Guide. Paging and Available Reports Paging allows you to display different sections of the total search results in the spreadsheet. Available reports is a list of all reports you can use inside Paragon. By clicking of the arrowhead next to each report folder, you will either show or hide the different reports inside that folder. By continuing to hold a left mouse click on a report, you can drag and drop (release the left mouse button) frequently used reports into your Favorites folder making them easier to access at a later time. Note: The reports available to you on your Paragon system maybe different than those displayed in this Quick Start Guide. 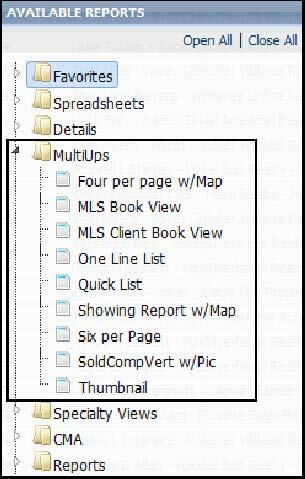 The selection of available reports will vary between MLSs depending on extra reports that have been created by the MLS, brokers and individual agents. On the spreadsheet, click the dropdown box on the right side of the screen to display a list of available reports. The reports are grouped into folders of similar types. When you click on the arrow head to the left of a specific report folder, the folder is toggled open to display the reports in the folder or toggled closed hiding the reports. Paragon has a report editor that will allow the creation of additional reports. An agent can create a report that only they can use. A broker and their admin staff can create reports just for themselves or they can create reports that can be shared with the office or multiple offices. 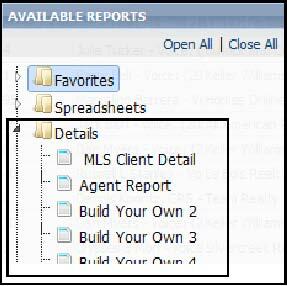 Your MLS staff can also create reports that can be shared with everyone in the MLS. Who can see the reports is dependent on the security level of the person creating the reports and the sharing option they choose. Prospect facing reports have fields that are appropriate for those not in the real estate industry. Agent and industry facing reports are proprietary due to the fields on the report and should not be distributed to prospects. Customizing reports: Many of these reports are customizable. When customizable, you are allowed to change the fields and text lines that are in white areas of the report template. Gray areas of the report template are hard coded in their design and cannot be customized. To enter the customizing mode, click on the blue “sprocket” or “gear” next to the word Customize. See “Customize button” section of this Quick Start Guide for more details on how to customize a report. Favorites: Are reports you have moved to the Favorite folder. You move a report to Favorites by continuing to hold a left mouse click on a frequently used report and dragging and dropping (release the left mouse button) it into your Favorites folder making them easier to access at a later time. There is no limit on the number of reports you can have in your Favorites folder. If you want to remove a report from the Favorites folder, click on the red “X” to the left of the report you want to remove. Clicking the red “X” will return the report back to its original folder. Clicking the red “X” will not delete this report. Spreadsheets: contains a collection of spreadsheet reports. Each spreadsheet can be customized to meeting your business needs. 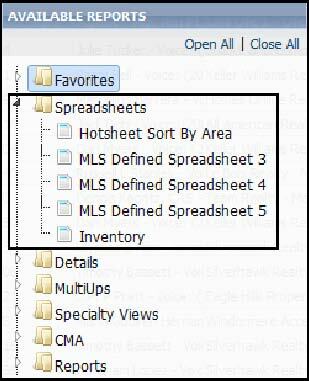 For more information on spreadsheets and how they are customized, please refer to the Quick Start Guide Spreadsheets. Details: contains reports focused on just one property. The reports contain a lot of listing details for the each property and may include pictures. MultiUps: contains reports where multiple properties are displayed on a single page. The reports contain some listing details for the each property and may include pictures. Specialty Views: contains unique reports and some of the legacy Paragon reports. 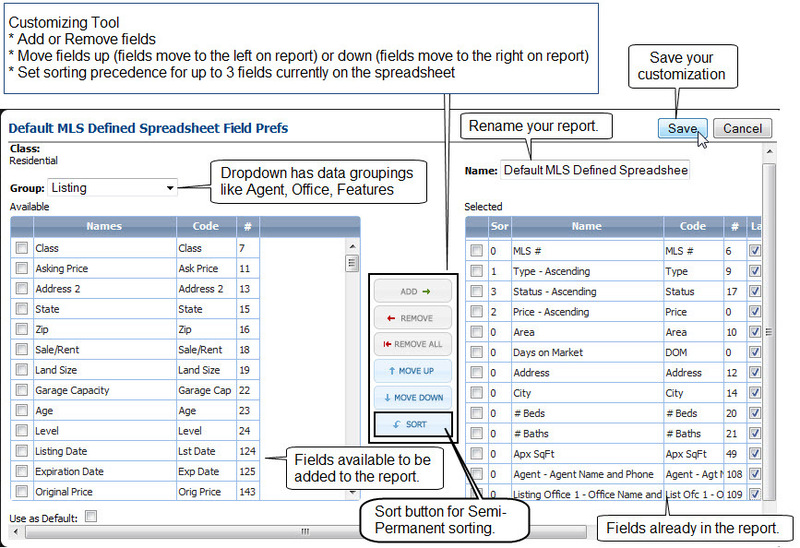 The All Fields Detail report is a system generated report and not customizable. There are 2 options for this report that is selected by the MLS and is applied to all Paragon users. Display all fields whether or not the field has data. Display only the fields that have data. Either way, all pictures for each property are displayed on the report. Due to its design, this report is almost always more than 1 page in length. Legacy reports in this section can be customized. However, the placement of the fields on the report is controlled by Paragon. The fields are grouped together on the report based on information/data types. Your option is to include the field on the report or not. 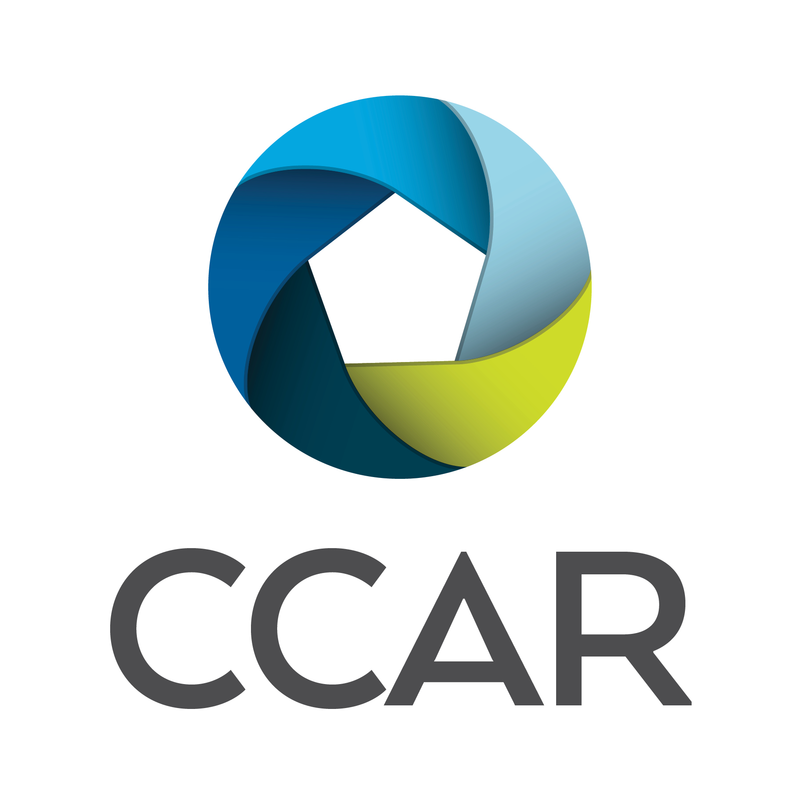 CMA: contains reports that are useful when comparing properties for buyers or sellers. 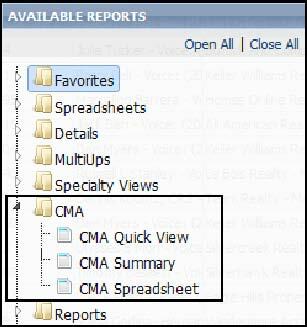 These reports are also used in the CMA module of Paragon. Reports: contains reports that allow you to look at market conditions based on the search results you have displayed, typically in a spreadsheet. Checked or Filtering button -after checking the boxes on the left side of the lines of property data, clicking the Checked button will show just the properties with a checked box. Properties with a checked checkbox are retained in the filtering process. Clicking a checkbox selects that property for further review or consideration when the Checked button is clicked. There is no fixed report location for checkboxes. Checkboxes are typically found near the top of the report. They could be on the left or right hand side of the report or near the picture. 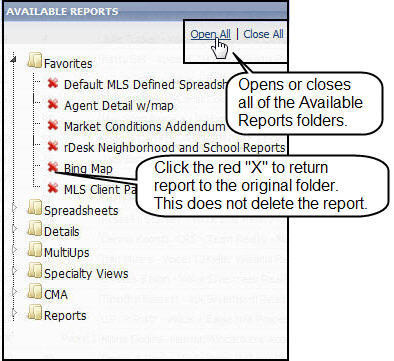 Each report can have a different location for its checkbox. Note: As you review different properties, your checks are retained as you move from page to page. You do NOT need to hold the control key as you check additional checkboxes. Note: You can filter your search results as many times as you want as you narrow down the results to the specific results you and your prospects are interested in. All or Un-filtering button -Clicking the All button removes all filtering and makes available the display of all of your original search results. Save button -Hover over Save and click on Save Search to save the search template that brought you these results. See Quick Start Guide Saving Searches. Print button -Hover over Print and select the type of printing you want to do. Print – prints the report you are currently viewing. Print+ -allows you to print multiple reports in one print job. You do not have to print the report you are currently viewing. Export data as a .CSV (comma separated values) file that has a date and time stamp for a name saved to the drive of your choice. This naming convention eliminates overwriting your exported results. Drive selection is determined by personal settings in Preferences > User > Application > Saving Export Files in Paragon 5. Customize button -Customizes the display of your search results. 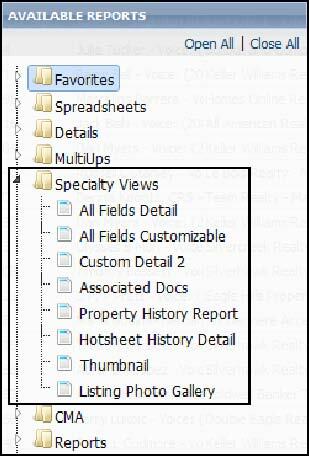 This button allows you to select the fields to be viewed, the location of the fields (legacy reports in Specialty Views excluded) and how the data is sorted. Fields allows you to add, remove fields to the report and position the fields in the report. Sort (semi-permanent sort -found when Fields is click), you can determine and save a default sorting of the results data by as many as three different fields. Sort (temporary sort) allows you to temporarily sort the data in your results by as many as three different fields. The sorting tools works similar to the sorting tool found in the Fields Functionality (above). To customizing a report, hover over Customize and click on Fields. On the report template select the field box you want to customize and double click it. The customizing tool will open. Using the customizing tool, add to or remove fields from the right side of the screen for the selected field box. Using the Up/Down arrows to position the field in the field box. For Text boxes, click the text box and type in the text. 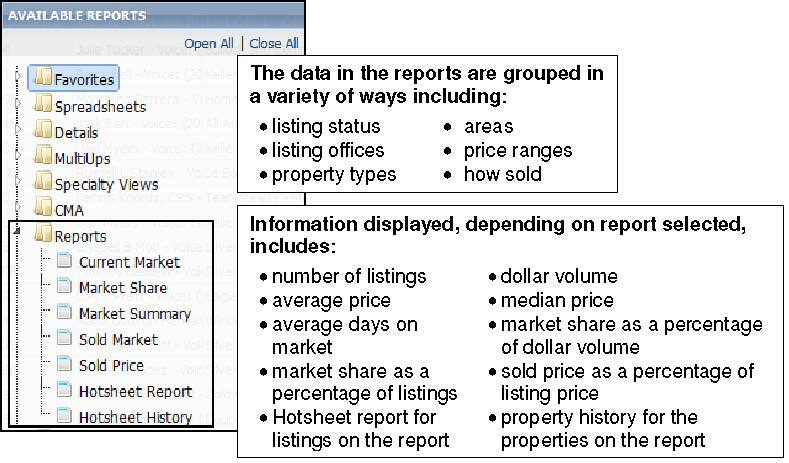 This text will appear for all properties using this report template. It may be best to use the text boxes as report titles i.e. Open House. 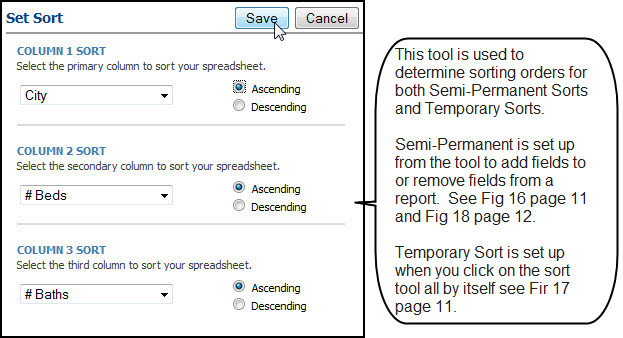 Sorting: Semi-permanent -In addition to placing fields on the reports, you can determine how your data will be sorted every time you display results on the spreadsheet. Clicking on Sort at the bottom of the Customizing Tool will open a new window. Sorting: Temporary – This sorting order is lost when you move to another report view. If you have a semi-permanent sort set up for the report, this does not delete it from the report. It temporarily resorts the results. Next time you view this report, the semi-permanent sorting will be used to display the results. Note: You can change your sorting order as many times as you want. All data is grouped by “City”. Within each city, group the properties by the number of “Bedrooms”. Finally, into the grouped data “City & Bedrooms”, add the “Bathroom” data. When you are finished setting up the sort, click on Save and return to the customizing tool. When you are finished customizing, click on Save. Every time you display this report, the data will be displayed according to the sorted based on a maximum of three (3) fields. Correction Button – You can notify the board/MLS of an error in the listing data for a specific property. While viewing the property in question, click on the Correction button. An E-mail template will open. In the body of the E-mail, advise the board/MLS of the errors. When you are done writing your E-mail, click on Send to send your message to the MLS. Actions button -allows you to display additional information on Results pages. By clicking on each of the optional actions, you toggle on or off the display of Criteria and Toggle Stats and the report view type (HTML – standard and PDF – optional). PDF button -allows you to toggle the view between HTML (normal view) and PDF. You can print from either view. Note: It’s possible to display both criteria and stats at the same time.